Several levels available to show your love for the library. Home of the Famous Book Sales! Mission: Supporting the Educational and Cultural Programs of the Van Alstyne Public Library. — Host fun and educational programs. — Purchase books and other resources. Our library is best known for providing free access to thousands of books, e-books, audiobooks, and DVDs, but today's library is a hub of programs for children, teens, and adults. A state-of-the-art computer lab allows residents, many living in rural areas with no internet access, a place to do coursework and search for jobs. Although the library is located within the City of Van Alstyne, patrons visit us from throughout Grayson and Collin counties as well as the city of Anna. On any given day, our library may see preschoolers gathering for storytime, elementary students experimenting with science, teens celebrating anime and adults meeting for book club. The public library is a home for lifelong learning. But, the city budget is limited -- this is where volunteers and donors step in. If you are new to our community: Welcome! 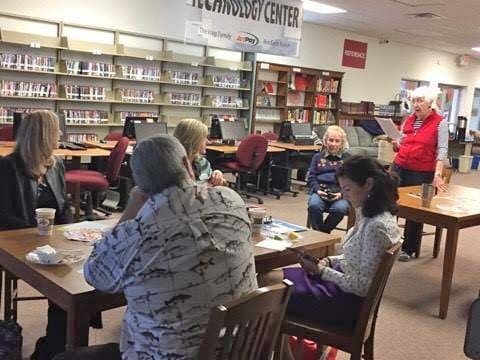 Supporting our library is a great way to get involved and meet new people -- we have more than 130 members, and there are volunteer opportunities to suit your schedule. No monetary donation is too small. Bring us your books for the book sales or join us for breakfast. For just $100 annually, your company or family can show your love for the Van Alstyne Public Library. Your company logo or your name will appear here on our home page. The City of Van Alstyne provides salaries, utilities, and operating expenses for the public library. There have been many grants that have helped with the library’s needs, but most important is our citizens’ participation. Friends of the Van Alstyne Library is a 501(c)3 non-profit organization. Your gift may qualify as a charitable deduction for federal income tax purposes.